This article is about the festival observed on the traditional Chinese calendar. For the first day of the year observed on other lunar or lunisolar calendars, see Lunar New Year. Chinese New Year[lower-alpha 1] (or generally referred to as Lunar New Year globally) is the Chinese festival that celebrates the beginning of a new year on the traditional Chinese calendar. The festival is usually referred to as the Spring Festival in mainland China,[lower-alpha 2] and is one of several Lunar New Years in Asia. Observances traditionally take place from the evening preceding the first day of the year to the Lantern Festival, held on the 15th day of the year. The first day of Chinese New Year begins on the new moon that appears between 21 January and 20 February. In 2019, the first day of the Chinese New Year was on Tuesday, 5 February, initiating the Year of the Pig. Although the Chinese calendar traditionally does not use continuously numbered years, outside China its years are sometimes numbered from the purported reign of the mythical Yellow Emperor in the 3rd millennium BCE. But at least three different years numbered 1 are now used by various scholars, making the year beginning CE 2015 the "Chinese year" 4712, 4713, or 4652. Beginning in 1982, the CCTV New Year's Gala is broadcast in China four hours before the start of the New Year and lasts until the succeeding early morning. Watching it has gradually become a tradition in northern China. A tradition of going to bed late on New Year's Eve, or even keeping awake the whole night and morning, known as shousui (守岁), is still practised as it is thought to add on to one's parents' longevity. The fifteenth day of the new year is celebrated as "Yuanxiao Festival" (simplified Chinese: 元宵节; traditional Chinese: 元宵節; pinyin: Yuán xiāo jié), also known as "Shangyuan Festival" (simplified Chinese: 上元节; traditional Chinese: 上元節; pinyin: Shàng yuán jié) or the Lantern Festival (otherwise known as Chap Goh Mei Chinese: 十五暝; pinyin: Shíwǔmíng; literally: 'the fifteen night" in Fujian dialect). Rice dumplings tangyuan (simplified Chinese: 汤圆; traditional Chinese: 湯圓; pinyin: tang yuán), a sweet glutinous rice ball brewed in a soup, are eaten this day. Candles are lit outside houses as a way to guide wayward spirits home. This day is celebrated as the Lantern Festival, and families walk the street carrying lighted lantern. Mainland China – Firecrackers were banned in a large amount of cities and urban areas in the 1990s. However, many cities have relaxed their restrictions since that time; for example, Beijing's urban districts revoked their ban in 2005, although they are still typically not allowed inside the 5th Ring Road. Even so, this is overlooked by authorities for the festival, provided there are no government buildings nearby. Bans are rare in rural areas. "Happy New Year!" (Chinese: 新年好呀; pinyin: Xīn Nián Hǎo Ya; literally: 'New Year's Good, Ya") is a popular children's song for the New Year holiday. The melody is similar to the American folk song, Oh My Darling, Clementine. The color red is commonly worn throughout Chinese New Year; traditional beliefs held that red could scare away evil spirits and bad fortune. The wearing of new clothes is another clothing custom during the festival, the new clothes symbolize a new beginning in the year, and enough things to use and wear in the this time. As with all cultures, Chinese New Year traditions incorporate elements that are symbolic of deeper meaning. One common example of Chinese New Year symbolism is the red diamond-shaped fu characters (Chinese: 福; pinyin: fú; Cantonese Yale: fuk1; literally: 'blessings, happiness"), which are displayed on the entrances of Chinese homes. This sign is usually seen hanging upside down, since the Chinese word dao (Chinese: 倒; pinyin: dào; literally: 'upside down"), is homophonous or nearly homophonous with (Chinese: 到; pinyin: dào; literally: 'arrive") in all varieties of Chinese. Therefore, it symbolizes the arrival of luck, happiness, and prosperity. Big Chinese population cities and towns like Jakarta, Medan, Singkawang, Pangkal Pinang, Binjai, Bagansiapiapi, Tanjungbalai, Pematangsiantar, Selat Panjang, Tanjung Pinang, Batam, Ketapang and Pontianak always have its own New Year's celebration every years with parade and fireworks. A lot shopping malls decorated its building with lantern, Chinese words and lion or dragon with red and gold as main color. 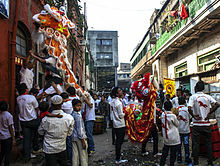 Lion dance is a common sight around Chinese houses, temples and its shophouses. Usually, the Buddhist, Confucian and Taoist Chinese will burn a big incense made by aloeswood with dragon-decorated at front of their house.The temple is open 24 hours at the first day, their also distributes a red envelopes and sometimes rice, fruits or sugar to the poor around. ↑ Roy, Christian (2005). Traditional Festivals: A Multicultural Encyclopedia. ABC-CLIO. p. 320. ISBN 978-1-57607-089-5. ↑ "Chinese New Year 2011". VisitSingapore.com. Retrieved 2 November 2011. ↑ "Chinese New Year Celebrated in Grand Scale in Yangon". Mizzima.com. Retrieved 28 January 2019. ↑ "Philippines adds Chinese New Year to holidays". Yahoo News Philippines. 2 December 2011. Retrieved 29 June 2013. ↑ "Festivals, Cultural Events and Public Holidays in Mauritius". Mauritius Tourism Authority. Archived from the original on 11 February 2016. Retrieved 28 January 2012. ↑ Crabtree, Justina (16 February 2018). "As the Lunar New Year celebrations begin, CNBC looks at Chinatowns across the world". CNBC. ↑ "Happy Chinese New Year! The year of the Dog has begun". USA TODAY. ↑ "Chinese New Year and its effect on the world economy". BostonGlobe.com. ↑ "The Year of the Dog – Celebrating Chinese New Year 2018". EC Brighton. 2018-02-16. Retrieved 2018-11-13. ↑ 中國古代歲首分那幾種?各以何為起點? [In ancient China, how to decide the starting point of a year?] (in Chinese). Central Weather Bureau. Retrieved 26 January 2017. ↑ "Chinese New Year Calendar". chinesenewyears.info. Retrieved August 2, 2017. ↑ "Embassy Holidays". Embassy of the United States: Bandar Seri Begawan, Brunei Darussalam. U.S. Department of State. Archived from the original on 13 May 2015. Retrieved 4 March 2015. ↑ "General holidays for 2018". Hong Kong Government. Retrieved 16 February 2018. ↑ "National Public Holidays in Indonesia". AngloINFO, the global expat network: INDONESIA. AngloINFO Limited. Archived from the original on 2 April 2015. Retrieved 4 March 2015. ↑ "Holiday Schedule". Embassy of the United States: Jakarta, Indonesia. U.S. Department of State. Archived from the original on 2 April 2015. Retrieved 4 March 2015. ↑ "Public Holidays in 2019 Decree Law No. 60/2000 on Public Holidays". Macao SARG Portal. Macao SAR of the People's Republic of China. Retrieved 24 Jan 2019. ↑ "Public Holiday Calendar". TravelChinaGuide. Retrieved 30 January 2017. ↑ "Holiday Schedule". Embassy of the United States: Beijing, China. U.S. Department of State. Archived from the original on 16 March 2015. ↑ "Jadual hari kelepasan am persekutuan 2012" [Federal Public Holiday Schedule 2012] (PDF) (in Malay). Putrajaya, Malaysia: Jabatan Perdana Menteri (Department of the Prime Minister). Archived from the original (PDF) on 29 March 2013. Retrieved 4 March 2015. ↑ "HOLIDAYS". Embassy of the United States: Kuala Lumpur, Mayalsia. U.S. Department of State. Retrieved 29 January 2017. ↑ "Proclamation No. 831, s. 2014 by the President of the Philippines, Declaring the Regular Holidays, Special (Non-Working) Days, and Special Holiday (for all Schools) for the Year 2015" (Press release). Malacañang Palace, Manila: Official Gazette of the Philippines. 17 July 2014. Retrieved 3 May 2017. 1 2 "วันตรุษจีน 2561 กับ 7 คำถามยอดฮิตที่คนอยากรู้" [Chinese New Year 2018 with 7 popular questions that people want to know]. Kapook.com (in Thai). 2013-01-07. Retrieved 2019-01-11. ↑ "Holidays". Embassy of the United States: Singapore. U.S. Department of State. Archived from the original on 21 February 2015. Retrieved 4 March 2015. ↑ "Chinese New Year". yourchineseastrology.com. 1 2 3 Lin Meirong (2011). "Jade Emperor". Encyclopedia of Taiwan. Council for Cultural Affairs. Archived from the original on 22 February 2014. Retrieved 12 September 2012. 1 2 3 4 Conceicao, Jeanne Louise (2009). "Hokkien community". Singapore Infopedia. National Library Board Singapore. Archived from the original on 7 November 2012. Retrieved 12 September 2012. ↑ "Thousands throw oranges to mark Chap Goh Meh". Thestar.com.my. 1 March 2010. Archived from the original on 2 March 2010. Retrieved 25 August 2010. ↑ Butler, Stephanie (2014-01-30). "Symbolic Foods Of Chinese New Year – Hungry History". History.com. Retrieved 2019-02-11. ↑ Huang, Wei; Xie, Ying (January 2012). "The New Year That Wasn't". NewsChina. NewsChinaMagazine. Archived from the original on 24 February 2015. Retrieved 24 February 2015. ↑ "Ofw chinese new year things to remember" (PDF). South East Asia Group [an agency introducing foreign workers to work in Taiwan]. Archived from the original (PDF) on 17 March 2016. Retrieved 29 January 2012. ↑ Mack, Lauren (27 February 2015). "Chinese Gift-Giving: What Not to Buy – Avoid These Chinese Gift-Giving Blunders". About.com. Retrieved 29 January 2017. ↑ "Soulprints: 1970". BOOKSOUL International Pte Ltd. 2005. ↑ Shan, Shelley (7 January 2012). "Ministry warns of heavy Lunar New Year holiday traffic". Taipei Times. Lee, I-chia (25 January 2012). "Despite rain, millions hit the road". Taipei Times. Lee, I-chia (29 January 2012). "Early start beats tolls and congestion as the holiday ends". Taipei Times. ... total traffic volume on Friday was 2.7 million vehicles, about 1.7 times the average daily traffic volume of about 1.6 million. "We estimate the total traffic volume [yesterday] was between 2.1 million and 2.3 million vehicles," Chen said. "Northbound traffic volume was much higher than southbound and peak hours were between 3 pm and 6 pm." ↑ "Chinese New Year parade doomed as Baird government's new route 'too narrow' for floats". Smh.com.au. 2015-08-15. Retrieved 2019-02-11. ↑ "Singapore in spring: Chinatown Chinese New Year Celebrations 2010". VisitSingapore.com. Archived from the original on 20 April 2016. Retrieved 2 November 2011. ↑ "Chingay Parade Singapore 2011". VisitSingapore.com. Retrieved 2 November 2011. ↑ "Chinggay Parade 2011 Highlights". Archived from the original on 31 July 2010. Retrieved 29 January 2017. "Chinggay Parade 2011 Highlights". Archived from the original on 31 July 2010. Retrieved 29 January 2017. ↑ "NAKHON SAWAN CHINESE NEW YEAR FESTIVAL". TAT. Retrieved 2019-01-10. ↑ "Chinese New Year in Phuket". PHUKET.COM. Retrieved 2019-01-10. ↑ "SUPHANBURI CHINESE NEW YEAR FESTIVAL". TAT. Retrieved 2019-01-10. ↑ Pramarnpanich, Tanachai (2018-02-16). "Gateway to the Chinese new year". The Nation. Retrieved 2019-01-10. ↑ "Princess Sirindhorn to open Chinese New Year Festival in China Town Bangkok today". TPBS. 2015-02-19. Retrieved 2019-01-10. ↑ "Princess Sirindhorn opens Chinese New Year Celebration at China Town". TPBS. 2014-01-31. Retrieved 2019-01-10. 1 2 3 4 5 "Hari-Hari Penting Di Indonesia" (in Indonesian). Archived from the original on 2016-10-08. Retrieved 2018-03-23. 1 2 3 4 5 6 7 "KEPUTUSAN PRESIDEN REPUBLIK INDONESIA. NOMOR 19 TAHUN 2002. TENTANG. HARI TAHUN BARU IMLEK" (PDF). kepustakaan-presiden.pnri.go.id. 1 2 3 4 5 "Penetapan Pemerintah 1946 No 2/Um::Aturan Hari Raya". ngada.org. Retrieved 2018-03-23. 1 2 3 4 "KEPUTUSAN PRESIDEN REPUBLIK INDONESIA NO. 24 TAHUN 1953 TENTANG HARI-HARI LIBUR". Aswin Weblog (in Indonesian). 2012-05-24. Retrieved 2018-03-23. 1 2 "Instruksi Presiden Republik Indonesia Nomor 14 Tahun 1967 - Wikisource bahasa Indonesia". id.wikisource.org (in Indonesian). Retrieved 2018-03-23. ↑ "Keputusan Presiden Republik Indonesia Nomor 6 Tahun 2000 - Wikisource bahasa Indonesia". id.wikisource.org (in Indonesian). Retrieved 2018-03-23. 1 2 3 "Keputusan Menteri Agama No. 13 dan 14 Tahun 2001 - Imlek Sebagai Hari Libur Fakultatif". www.hukumonline.com. Retrieved 2018-03-24. 1 2 "Pemerintah Tetapkan Hari Libur Nasional dan Cuti Bersama Tahun 2017". Retrieved 2018-03-23. ↑ "City of Sydney Official Chinese New Year Website". Cityofsydney.nsw.gov.au. 1 January 2011. Archived from the original on 31 August 2011. Retrieved 2 November 2011. ↑ "Chinese New Year in Australia". www.chinesenewyear.net.au. Retrieved 5 January 2017. ↑ "East Meets West Lunar New Year Festival". Web.archive.org. Retrieved 2019-02-11. ↑ "Tourists flock for Year of the Rooster". www.odt.co.nz. 28 January 2017. Retrieved 21 December 2017. ↑ Harris, Elizabeth A.; Grynbaum, Michael M. (22 June 2015). "Mayor de Blasio to Make Lunar New Year a School Holiday". The New York Times. Retrieved 13 September 2015. ↑ "Le Nouvel An Chinois". mairie13.paris.fr. 2 February 2013. Archived from the original on 27 January 2013. Retrieved 22 February 2013. ↑ "Le grand défilé du Nouvel An Chinois". mairie13.paris.fr. 2 February 2013. Archived from the original on 1 February 2014. Retrieved 22 February 2013. 1 2 Friedman, Sophie. "Top 10 things to know about Chinese New Year". nationalgeographic.com. Retrieved February 5, 2019. In Mandarin, they’ll say gong xi fa cai (恭喜发财), wishing you a prosperous New Year. In Cantonese, it’s gong hey fat choi. Still, if you wish someone xin nian kuai le (新年快乐), literally 'happy new year,' that’s perfectly welcome, too.